The Green Army is an Australian Government initiative that helps connect young Australians with meaningful work through environmental and conservation projects across the nation. The Green Army can provide you with skills, training and experience to improve your employment prospects while you work on projects that generate real and lasting benefits for the environment and Australian Heritage sites. 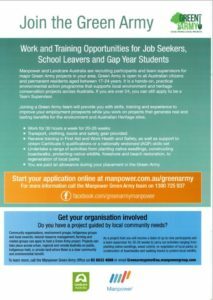 Simply join the Manpower Green Army Participant Community by registering your details, projects are now open for applications in our area. Follow the link to the Green Army poster located above. Manpower will ensure you are provided with transport to and from a nominated pick up point and get you to and from training activities. You will be provided with appropriate clothing and safety gear during your time on the project including, boots, trousers, hat, gloves, shirts and where necessary wet weather gear and jumpers or jackets for cold climates.